Birdbaths Galor takes the guess work out of buying a birdbath. Birdbaths Galor will inform you about "ALL" the birdbaths on the market. 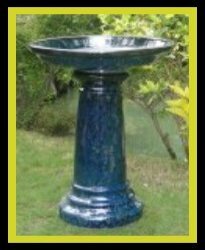 Birdbaths Golor is your one stop shopping web site. 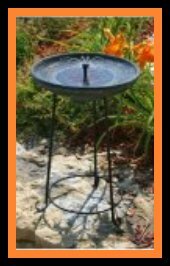 My friends at www.birdbaths.com has everything that you could possibly want, so take the time to look around and see what you can find. I know that you will be happy with what you choose and that it will be the perfect piece of "garden art". The first bath that we will talk about under Birdbaths Galore is.. 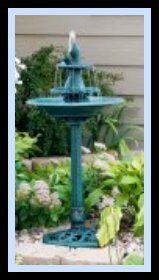 The Hanging Birdbath.. it is a cracker-jack way for you to attract birds to your garden. One excellent characteristic of the hanging birdbath is it's portability. It's perfect for the person that moves from place to place and the apartment dwellers. Most hanging birdbaths weigh very little, so they can be hung from a hanger that is attached to your wall. Birds love to take baths. During the summer, when I water my plants with the sprinkler a lot of water accumulates on my driveway. I have looked out the window many times and have seen the jays splashing and preening, the doves walking around through the wet grass looking for food and cooing, and the cardinals flitting around from driveway to branch. It puts a smile on my face everytime. 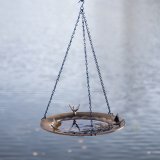 Hanging birdbaths are not as stable as the pedestal variety and tend to sway. Add rocks to the bottom of the bowl and this will steady it. If it sways to much when the birds land, it might scare them. These baths are easy to clean and there are some that will accomodate a bird bath heater. 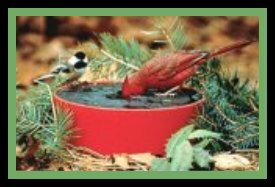 When you use a heater in your bird bath, your birds will have access to drinking water all year round. This is especially true if you live in an area that stays below freezing for long periods of time. 1. Easy to move from place to place. 2. Great for apartment dwellers. 3. Can be hung from almost anything. 4. They usually cost less than the more traditional kinds. 5. They can be hung so that the bath sits right on top of your flower bed. It really looks good and that cannot be done with a regular bird bath. 6. They come in a variety of colors, materials, and designs. 7. They come with all the hardware you should need for hanging. 8. Since it can be hung almost anywhere, be sure to hang it where you can see it. What better way to make chores more enjoyable, than to have a nice view of your "bathing birdies" to watch while you sweat. No.2 in birdbaths galore is.. The Copper Birdbath.. These birdbaths are beautiful and your birds will be taking their baths in luxury. The styles are like no other. The designs are sleek and tasteful. This bath looks good anywhere you decide to place it. This is because not only are the bowls beautiful, but the stands that that the bowls sit on are designed beautifully too. 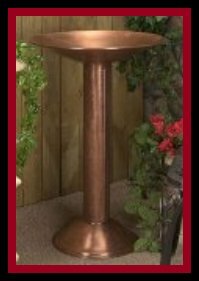 The Copper Birdbath is one item that truely gives garden art it's name. The textured surface on many of the baths assures that the birds do not slip while bathing. Your birds will thank you for it. The sizes of these baths range from 12 to 24 inches in diameter. They are so nice that you will enjoy them as much as your birds do. The Ceramic Birdbath.. A Ceramic Birdbath is beautiful too. They are bright,shiney, and very colorful. They really add that "WOW" to your garden. No.3 in birdbaths galor is..
You can get them hand painted with images of fish, flowers, or abstract designs. The shiney blue is very popular. Several of these baths have features that look like waterfalls. The water cascades from one bowl to another, with the largest bowl being at the bottom. They also come in a single basin style. No.4 in birdbaths galor is.. The Birdbath Fountains.. A Birdbath Fountain is a peaceful and soothing birdbath. Listening to the water dripping and bubbling makes you want to lie back in your swing, close your eyes, and let all your worries fly away on the wings of your feathered friends. It has been said that a fountain birdbath will double the amount of birds that visit your backyard. These birdbaths come in a variety of styles and sizes. Some are even solar powered, heated, and tiered. My friends at www.birdbaths.com have sizes that range from 2' to 4' across. There is such an assortment to choose from. I'm sure you will find one that is perfect for your garden area. No.5 in birdbaths galor is.. The Mosaic Birdbath.. This bath is my all time favorite of the more birdbaths. I'm just a little bias because I put a lot of work into them. They are consuming and tedious, but very rewarding to create. 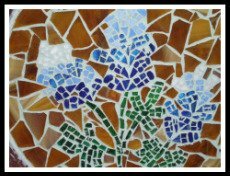 I like the freedom that I have when making mosaics because, I can cover almost any surface or any object. I can use materials such as clay, glass, tiles, mirror, broken china, jewels, sequins, found objects, and any other embellishment that I can possibly think of. The materials that I used when I first started was the ceramic tiles. Now, I tend to mainly use stained glass, both the opaque and the translucent. Then, I toss in some mirror pieces for happiness. I find that the stained glass is simple to cut and easier to manipulate, but that's just me. Other materials that I enjoy using are sea glass, millefiori, and broken dishes. The broken dishes add subtle colors and always gives my work a vintage look. It's also a good way to recycle damaged china, that may have a sentimental value to you. No.6 in birdbaths galor is.. The Heated Birdbath.. I have never had a heated bath before, but living in Southeast Texas, I would only need one for about a month, total. Next winter I might try one though. My husband and I work very well together as long as he does his job and I do mine. So, I do all the drawing and designing and he cuts out all of my single pieces, like butterflies, flowers, animals, etc. He also, puts the bird feeders together and anything else that requires a screwdriver and a pair of pliers. The colors and textures that I choose always seem to say something about my personality. I like to think of them as a unique expression of my personal tastes. Having a heated birdbath will give you the opportunity to take bird pictures year round too. As with the other birdbaths, the heated bath comes in different varieties. You can get the kind that you mount on posts, the pedestal type, and some that you can mount on your porch or deck. 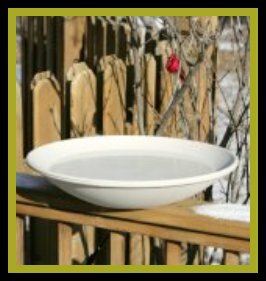 Remember, you can use your heated birdbath year round because, the heating unit can be removed. The most popular materials are plastic, granite, and terra cotta. 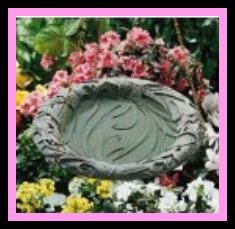 This birdbath is the perfect addition to your garden area. Everyone will love watching all the feathered friends that visit your garden. Oh Yea, and it is a beautiful piece of "garden art". No.7 in birdbaths galor is.. The Solar Birdbath.. Having a solar birdbath these days is extremely smart. The price of electricity has skyrocketed. So, if your like me, you appreciate any way that you can save money. Solar does not require plumbing or wiring. A solar bath has solar panels that are in the bowl. These panels power a pump that is hidden in the base. During the day these panels collect heat from the sun, which in turn provides the energy to circulate the water and prevents it from becoming stagnate. Since the solar bath does not require wiring, you can place it anywhere in your garden or in your yard that receives sunlight. Take good care of your solar bath. The cold weather can damage your bath. So, during the winter months you will need to replace the solar unit with a non-solar insert or clean it and put it away until the next winter. Removing the solar unit is not a hard job and it only takes a few minutes to change out. Remember to clean your bird bath about every three days. You don't want to raise a mosquito family. I know that more birdbaths has been very informative. I know that it will help you decide which birdbath will be the perfect piece of "garden art for you. Please check back often because I will be adding even more birdbaths to this site. Goodies estore Page1 and Page 2.